This freebie is a NO PREP articulation activity for students to enjoy while practicing their speech sounds. Just PRINT & GO! 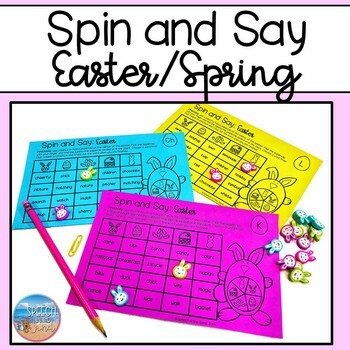 Students may use a pencil and a paperclip to spin on the spinner provided on each sheet. Then, they find the Easter/Spring picture on the chart and choose a word from that column to practice using good speech sounds. When their turn is finished, they can color the box, stamp it with a dot marker, place a mini eraser on that box, or simply cross it off with a pencil. Play BINGO style or see how who can fill their entire sheet first! Each sound is found in the initial, medial, and final position in the chart. There are two sounds to a page (each 1/2 sized) to save some paper and ink! Sounds included: K, G, F, V, CH, SH, J, TH, L, R, S, Z, and L, R, & S blends. An open ended sheet is provided to write in your own targets or to use with mixed groups!